L is for Lucy. The name of our daughter. Due in on November 25th. She is currently nestled in my tummy, listening to Stars through the headphones resting on my belly. And I am so in love with her already. I have always loved the name, though. The day before Nathan and I found out the gender of this little one, I was walking around the University of Arkansas campus, hoping to come up with the perfect name if our child was a girl. The entire walkway of the UARK campus has the names of every graduate etched in the cement. I looked down, and there was the name "Lucy" jumping out at me. I immediately called Nathan and ran the name past him. He LOVED it! 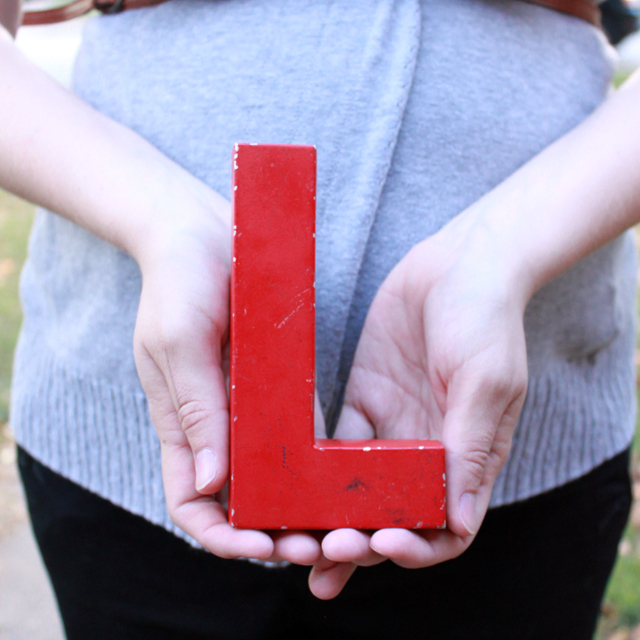 This past weekend, My mother and I were antiquing, when I put my hand down on a table for support, and noticed that my hand was resting on this red aluminum "L". It was $4, and the perfect addition to the girls' room.